Founded by national not-for-profit organisation Jean Hailes for Women’s Health, the campaign has been a permanent fixture on the Australian health calendar since 2013. 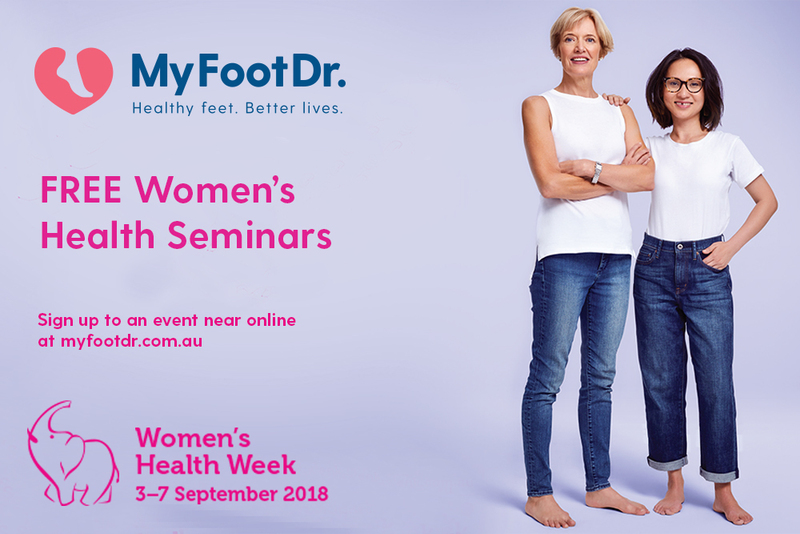 This year the team at My FootDr are proudly supporting Jean Haile’s Women’s Health Week by hosting events dedicated to women’s foot health. It’s easy to understand why women’s feet need extra care – you spend long hours on your feet at work and doing all the running around, often in uncomfortable shoes worn in the name of fashion. At My FootDr, we’re committed to helping women look after their feet at all stages of life and all lifestyles. At our free health seminars, our Podiatrists will provide you with information on common women’s foot problems and give you expert tips on how to care for your feet. Some of the topics will include common foot problems such as heel pain, fungal toenails, bunions, corns, and calluses. By signing up and attending the event you’ll receive free health tips aimed at inspiring you to live a healthier life plus exclusive offers and specials on podiatry services and footwear. Bring your female family and friends for an evening not to be missed! Women’s Health Week is our signature campaign held annually in the first week of September. This online and on-the-ground event is dedicated to getting women, communities, organisations and media openly talking about all aspects of women’s health. Now in its sixth year, Women’s Health Week continues to grow. In 2017 more than 57,000 women participated in 1588 events around the country, from our capital cities to remote and rural regions. Our goal continues to be to raise awareness of the importance of maintaining good health and preventing future health problems for all women in Australia.